New data from the Cromford Report in Arizona has been released. Data clearly shows a decreasing supply of homes for sale, corresponding with increasing home values. 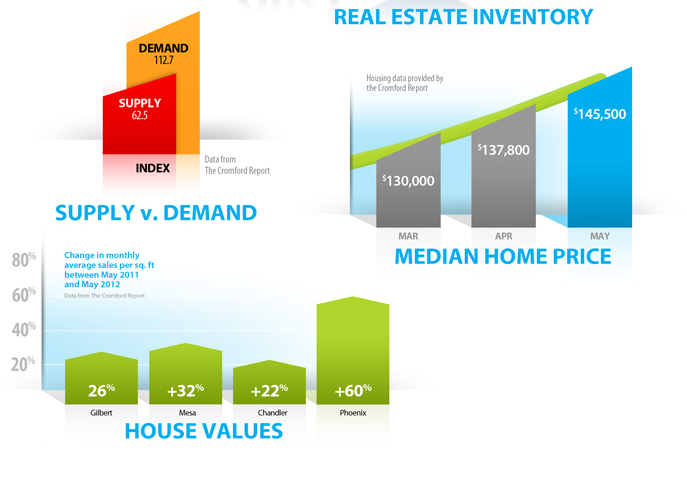 Demand for homes has also increased dramatically with the Demand Index almost double the Supply Index. The Demand Index is listed at 112.7 and the Supply Index is 62.5, indicating that almost twice as many homes are desired as compared to what is currently on the market. The resurgence of multiple bidding wars is a clear indication of this as well. The median home price in Phoenix has rose from $130,000 in March to $145,500 in May of 2012. That is a huge surge in two short months. The year over year changes in monthly average sales per sq ft between May 2011 and May 2012 has also dramatically spiked anywhere from 26% to 60% depending on the area of the Valley. Click to see more information about current Scottsdale real estate market trends. Call Carmen Brodeur at (602) 791-0536 to schedule a showing of any homes in Scottsdale. Vote for Carmen for Best Arizona Realtor!